It’s the week of the Apple Cup, when the football rivalry between Cougars and Huskies reaches a frenzied peak. So fans might be surprised to see that the two schools are using this moment to set aside sports and roll out a theme of university unity. 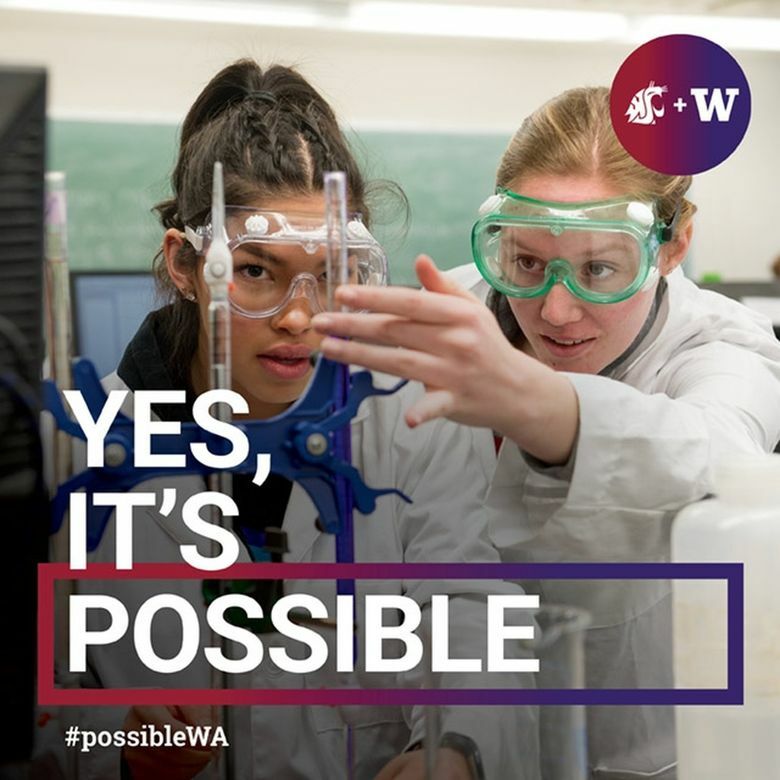 Washington State University and the University of Washington have launched a joint $100,000 ad campaign that blends Cougar crimson with Husky purple. It aims to convince people that both of the state’s big research universities — and all of the state’s other two- and four-year schools — are doing a good job of getting students through college debt-free. It’s meant to rebut a common perception fed by national news stories that college is unaffordable, and that most students are finishing with huge loan bills, said UW President Ana Mari Cauce. In fact, research shows that about half of this state’s college students finish with no known debt at all, in large part because of a state policy of generous financial aid. “Our public universities are doing a fabulous job of making it affordable,” she said. Only 4.7 percent of students who go to one of Washington’s four-year schools default on a student loan they can’t pay, compared to the national average of 11.5 percent. Of those who do take on loans for college, the average debt for Washington students was less than $24,000. And the state ranks No. 2 nationally in the amount of financial aid it provides to undergraduates to pay for college — with programs like College Bound, which promises to pay tuition and fees to low-income students who sign up in eighth grade, and the State Need Grant, which offers money that doesn’t need to be paid back. Both Cauce and WSU President Kirk Schulz say they often hear parents and students voice a concern that college is out of their financial reach, and in any case, a bachelor’s degree isn’t necessary for many jobs. Through the UW’s financial-aid package for low-income students, called Husky Promise, 31 percent of in-state undergraduates at the UW’s three campuses pay no tuition. At WSU, about 27 percent pay no tuition, and many of those students get financial aid through WSU’s Cougar Commitment. Schulz says he often hears from WSU students who assumed they couldn’t afford college, but applied anyway and were surprised at the size of the financial-aid package they received. The ad campaign is also meant to showcase how the two universities work together and have a good relationship — everywhere, that is, except for the sports fields. Cauce thinks the Huskies will take home the Apple Cup on Friday in Pullman, while Schulz predicts a 35-17 Cougar win. “I think it’s going to be an epic game,” Cauce said.